There’s been another potential bump in the road in the relationship between the City of Boise and app-based car service Uber. After a row with the city a month ago, Uber agreed not to charge in Boise until the two sides settled on a long term operating agreement. 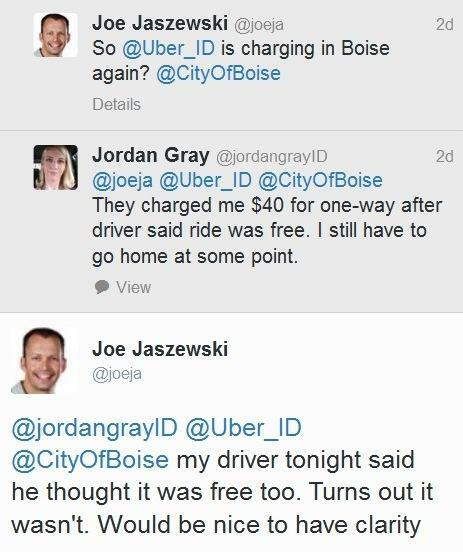 But some Boiseans took to Twitter over the weekend to complain about being unexpectedly charged for Uber rides. City spokesman Mike Journee said Tuesday the city was not aware of Uber having charged anyone since it promised not to. But an Uber spokesman said it had accidentally done just that. Amodeo did not say how many riders were charged or how long the technical error lasted. When notified that Boise riders had been charged and that Uber was reimbursing them, city spokesman Journee said it was a good response. Uber later tweeted back to Joe Jaszewski and Jordan Gray that they would get refunds. Jaszewski confirms that he got his. @joeja @jordangrayID Hi Joe - We'll refund any charges that have occurred today. Thank you for your patience! The city of Boise has issued a cease-and-desist order to Uber, the app-based car service company. City officials say Uber is violating an agreement not to charge passengers until the city gives it the go ahead. Uber has been operating in Boise since October under a temporary agreement with the city. Boise and Uber were in negotiations for a permanent contract. Uber is coming to Boise, at least temporarily. The ride-sharing app, which connects passengers with drivers, starts a temporary free trail in the city Thursday. Uber has been around since 2009 and operates in more than 200 cities worldwide. It works like this: riders download an app on their phone, plug in a destination, and choose a driver to pick them up. Drivers use their own cars. The Treefort Film Fest is prepping to bring a diverse batch of movies to Boise March 25-29. As part of the annual Treefort Music Fest, the multi-day event will highlight indie short and feature films that don't get a lot of mainstream attention.